For the Yurcek family, a Christmas from long ago changed everything with a visit from Santa and the miracle black garbage bags left on their stoop. In their season of hopelessness with a dying baby, they were empowered. Better Endings New Beginnings and Ann Yurcek play Santa by gifting "Tiny Titan One Small Gift" a story of encouragement in a season of struggle as a free Amazon download. We may not have gifts, but what we do have is family. 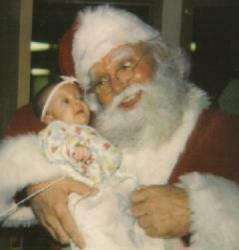 We need hope, my baby cannot die on Christmas. Better Endings New Beginnings publishes stories to change hearts. By Christmas, a once struggling middle-income family had fallen into poverty with hundreds of thousands of dollars of medical bills to save their tiny daughter, born with a severe form of Noonan Syndrome, the family was desperate. Their baby was critically ill. Their cupboards were bare. They had no gifts to give. The parents skipped meals to feed their children. Ann boiled water on the stove. All were shivering in the cold house. Jim was soon to be unemployed. Their baby, Becca, lay in ICU dying, she was much too sick to be held. The doctors believed she had little chance of survival. Twenty-three years ago in 1989, with five children and a dying baby, the Yurcek's were in need of a miracle. On Christmas Eve, Ann prayed for a miracle. "We may not have gifts, but what we do have is family. We need hope, my baby cannot die on Christmas." And they left their tiny baby in the hospital to journey home to a dark house. As they pulled up into the driveway, their car lights illuminated more than a dozen black stuffed garbage bags. Marissa, age 5, asked, "Why did Santa leave presents on the steps?" Ian, age 7 answered, "With all of this dummy there was no way Santa could come down the chimney," and Kristi, age 10 added, "Besides the door is locked." The bags were filled with gifts and groceries and that provided the hope Ann had prayed for. But, miracles didn't stop at the doorstep, a phone call from the hospital announced Becca's condition had been upgraded and she was stable. Later they discovered an unknown Santa paid their utility bills. To this day, the family has no idea who Santa was. The Yurcek family was blessed to move forward. And this generosity inspired a depressed father to make a career change to better his family by going back to school and six years later begin medical residency to become a surgeon. In 1997, the Yurcek family opened their hearts and reunited six brothers and sisters separated in the foster care system through adoption. And in raising these children, they discovered their experience with medical special needs and advocacy gained by the life experience of Becca would be what they needed to navigate the mental health needs of their new children diagnosed with fetal alcohol spectrum disorders (FASD) and other challenges. The Yurceks continue to remember that first miracle of answered prayer and they understand the gift of a hand up until you can stand on your own two feet. Award winning author, Ann Yurcek states, “Jim and I have been down and out. More than once, we've lost nearly everything. The results of someone or some ones who cared provided the catalyst for us to not only change, but become future miracle Santas, There is always someone you know who needs a miracle, and if we have the opportunity, we return the hope the was given to us. It's about making someone's load a little lighter because you have walked it." Founded in 1986, Better Endings New Beginnings is a non-profit niche publisher that opens the hearts and minds of persons to understand the extraordinary lives of individuals with special needs. In 2012, the company received one international and eight national awards for their recent releases. Ann Yurcek, winner of Dove Award. 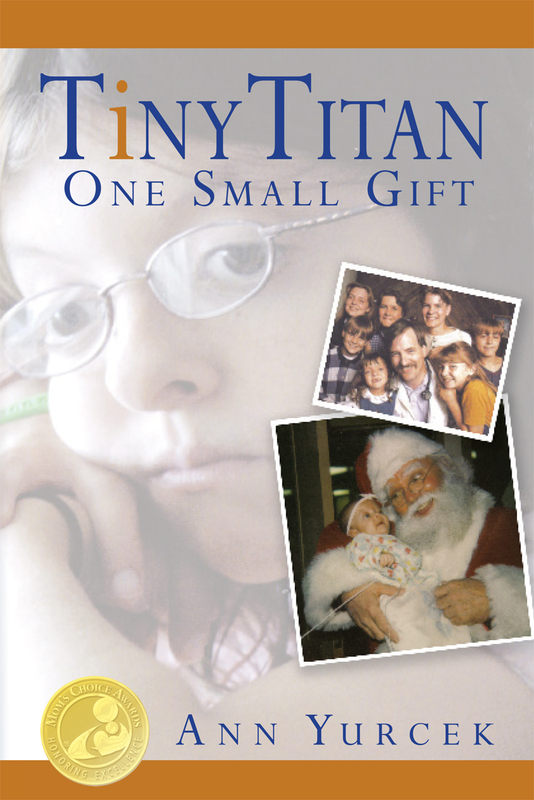 Mom’s Choice Gold Award – Non fiction and Silver Award – Most Inspirational offer the Christmas Chapter on her website http://www.annyurcek.com and beginning on December l8 for five days the Kindle Download for "Tiny Titan, One Small Gift" will be available for download for free. Read Chapter 9, Christmas to be inspired.